The 10 Best Hot Dog Joints in Oregon! Hot dog lovers know the craving—whether it’s a day at the coast or shopping downtown, there are times when only a hot dog will do. Oregon residents are particularly lucky in this respect. From handcrafted gourmet sausage dogs to classic old school corn dogs, Oregon has it all. Following are just 10 of the many fine hot dog joints sprinkled throughout the state. Located on Highway 99E in the small agricultural town of Junction City, he Junkyard serves up ultimate brats along with other classic fare in an environment that’s saturated with old-school diner memorabilia. Their chili dog and fries can’t be beat for a traditional flavor combination. Follow this Eugene favorite on Facebook to keep up with their current location. They can usually be found downtown during the week and in front of Eugene’s iconic Ninkasi Brewing Company on Saturdays. Red Five serves Oregon beef only. Be sure to try their Ninkasi smoked IPA beer brat for a true taste of Oregon. It really tells you something when a place has been in business for more than 80 years—it’s doing something right. In Nick’s case, this means serving the best Coney Island dogs west of Coney Island. Besides the traditional Coney Island Dog, they’ve got a veggie Coney for the non-meat eaters in your crowd. This hip Hawthorne Boulevard staple specializes in iconic New York-style hot dogs and fun. Enter their annual hot dog eating contest for a chance to win a golden t-shirt, or just stop in for a game of ping-pong and one of their quintessential New York Dogs with cheddar, yellow mustard, chopped onions, and chili. Zach’s also has a build-your-own-dog option. Step back in time with a visit to Bob’s Weiner Stand on River Road in Eugene. All-beef dogs combined with 50s kitsch, a huge parking lot, and a pleasant, covered outdoor seating area make it a favorite stop of classic car cruise-ins, so you might get an antique car show along with your dog when you stop at Bob’s. You can’t go wrong with the all-beef Polish dog topped with your shredded cheddar and your choice of condiments. Top off your dog with a thick shake made from real ice cream. Hot dogs are grilled in this Medford mobile food van instead of boiled, and the owner’s creativity shines in each menu item. 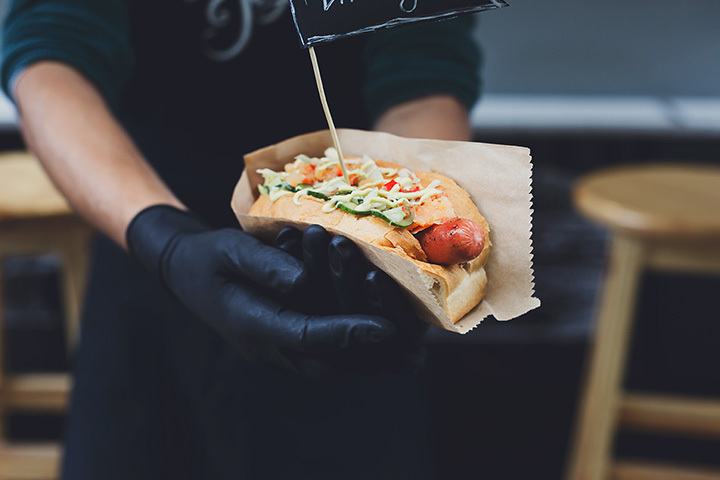 You’ll find such delectable delights as grilled bacon dogs, burrito dogs, pastrami bacon dogs, and pulled pork bacon dogs. No one walks away hungry from this place. Otherwise known as corn dogs, Pronto Pups were invented at this very location more than 80 years ago. They’re still prepared in the traditional fashion here and make a perfect excuse to load up the car and head to the beach for the day. If old-school Pronto Pup goodness isn’t enough of a temptation, you’ll be able to experience the world’s first mechanical riding corndog. Along with the original Pronto Pup, menu items include pups made with zucchini batter, spicy pups, cheese pups, and veggie pups. Different pup sizes are available to accommodate a variety of large and small appetites. Few things work up a good appetite better than fresh mountain air, and Bendites as well as visitors to this Central Oregon town count on Bend Mountain Dogs when they’re craving something tasty. You’ll find them on Wall Street in downtown Bend. Unlike many hot dog joints, Bend Mountain Dogs is open late at night, making it an ideal place to stop after an evening of microbrews and music. Cheese enthusiasts who like it hot are encouraged to try the Three Fingered Jack—a dog smothered in pepper jack, Swiss, and cheddar cheese topped off with barbecue sauce and jalapenos. Roxy Dawgs is so well loved among Oregonians that one location isn’t enough— you’ll find it in both Salem and Corvallis. Roxy Dawgs offers the ultimate customized hot dog experience. You choose from smoked sausage dogs, 100 percent beef dogs, German brats, vegan dogs, smoked kielbasa, or spicy Cajun-style sausage and then doctor the dogs to suit your personal preferences at Roxy’s condiment bar. Sausages, buns, and condiments are made onsite at Dog Town Food Cart. This Southeast Portland food cart is found at Tidbit Food Farm & Garden, so stop by and enjoy an LA street food style bacon-wrapped by Tidbit’s fire pit before or after shopping for your yard and garden needs. A covered outdoor beer garden is available for the over 21 crowd.